Insights let you see more about your audience and how your account is performing. You can also view insights for specific posts and stories you’ve created. Insights are split up into 3 sections – Activity, Content, and Audience. Activity lets you view important Interactions like profile visits and website clicks. You can also view Discovery, which is how many people see your content and where they found it. Content lets you view Insights on your Posts, Stories, and Promotions such as engagement, impressions, and reach. Audience tells you more about your followers and audience in categories of age range, gender ratios, and top locations. When converting to a business profile, you can include more contact information about your business. You’ll have options like Get Directions, Call and Email, depending on the contact information you provided. In addition, you can choose to add a call-to-action button such as Get Tickets, Start Order, Book, or Reserve. These are great tools to have to boost an upcoming event or direct more traffic to your website. You can run ads directly from the Instagram app. Once you’ve converted to a Business Profile, you can use the Promotions button from your profile to run post and stories ads. Your ad will be submitted for review to make sure it meets Instagram’s ad policies and will begin running after it’s been reviewed and approved. You will be provided Insights for these ads and promotions as well. When promoting on Instagram, your ad will appear in people’s feed or stories. If you want your ad to only appear in one placement, you’ll create your promotion in Ads Manager. There are two ways to set up an Instagram Business Profile. You can upgrade your existing personal profile or create a new account. You will find both of these options under Settings>Account. 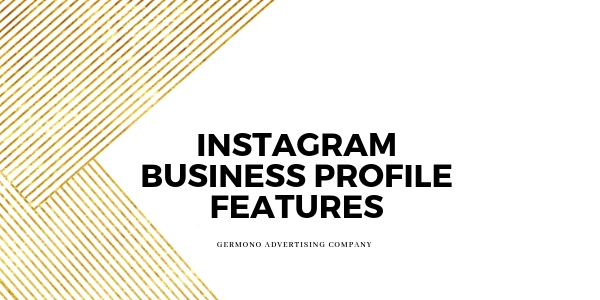 To have access to all of these sweet features we’ve been talking about, you’ll need to connect your new Instagram Business Profile to your Facebook Business Page. There will be a step-by-step guide once you get started! If Instagram isn’t part of your business’s social media strategy, you’re missing out on a HUGE opportunity. If you need help getting started, please reach out to bobbieanne@germono.com and I’ll be glad to get you on the right path! Happy marketing!